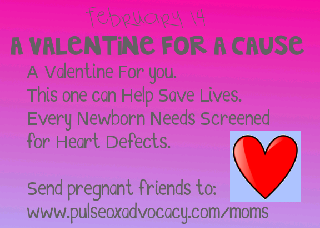 One of the things we use my blog for is to draw attention to congenital heart defects (CHD). I was born with coarctation of the aorta(CoA), bicuspid aortic valve with stenosis and had a patent ductus arteriosis (PDA). At a week of age my cardiac surgeon removed the PDA and repaired the CoA with a subclavian flap. One of the reasons the doctors were able to find the CHDs was because a simple and inexpensive test called a pulse ox. Its a little device that measures the oxygen levels in your blood along with pulse. My parents were blessed, Tennessee did not have a law concerning pulse oximetery at that time. Approximately 1 in 100 babies in the U.S. are born with a CHD. You have to be aware.